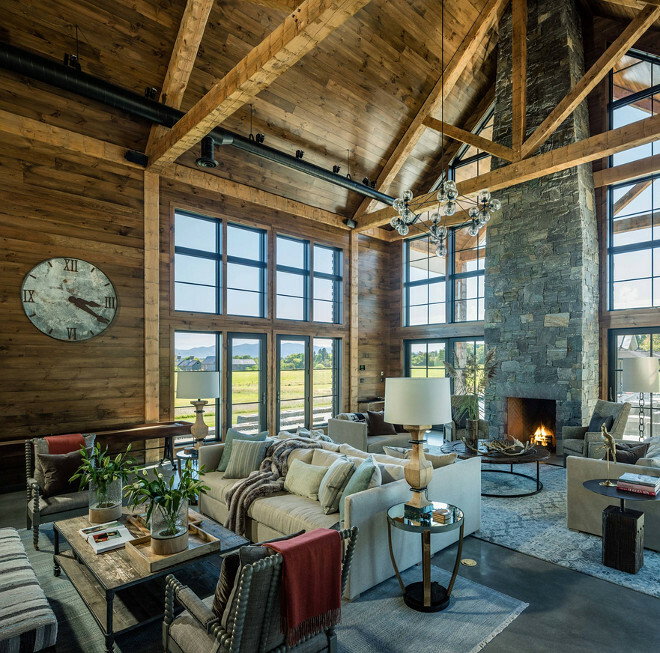 Fresh and new interior designs always awaken my senses. 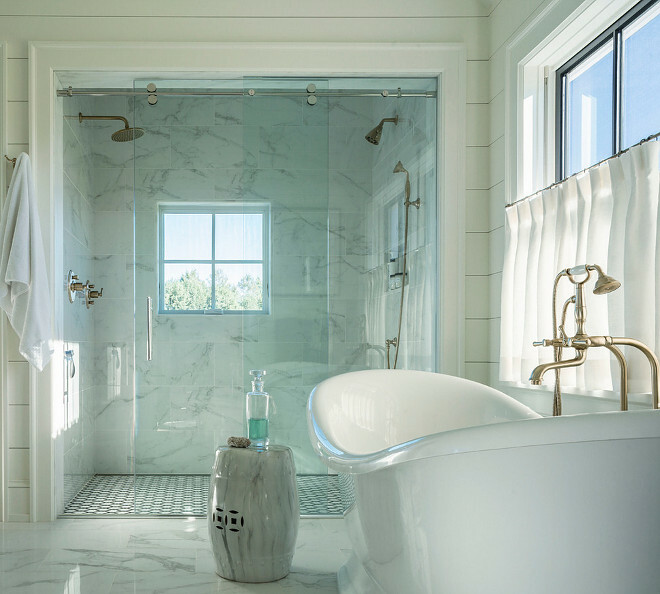 If you’ve read my blog for awhile, you probably know that coastal homes are usually my favorite, but I do not turn my back to a well-designed farmhouse and in this post, you will really see a mix of many interior styles. 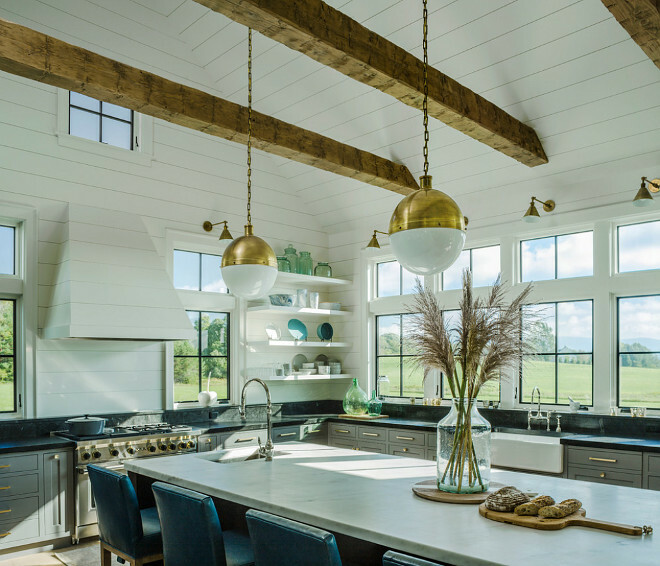 There’s something to be learned and admired in each of these farmhouse, coastal, and transitional interiors you’ll find in this post. 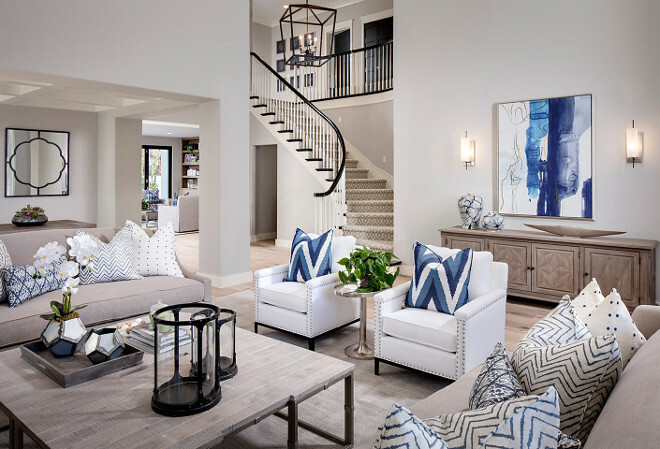 Make sure to find a quiet spot and take a close look at these spaces, even if some of them are not really your style. Look at the pictures and find what you like and what you don’t. This will help you to refine your taste and your style. 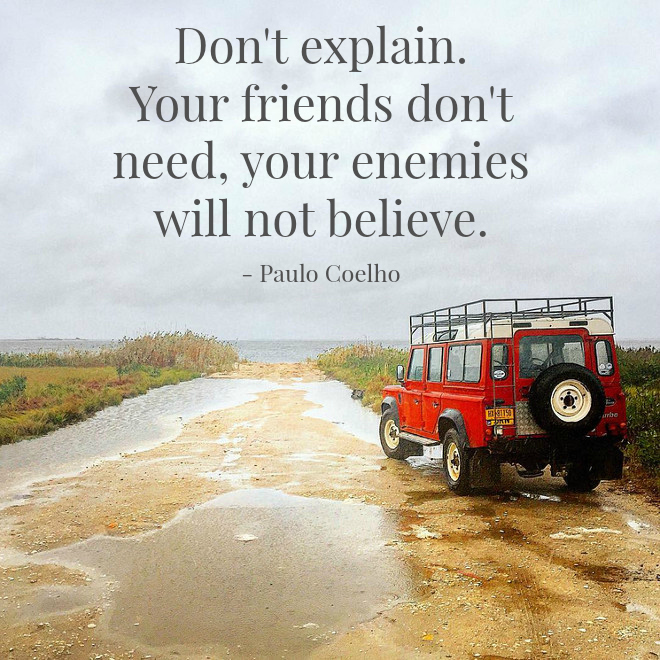 The more we see, the more we know, the more we understand what really works for us. 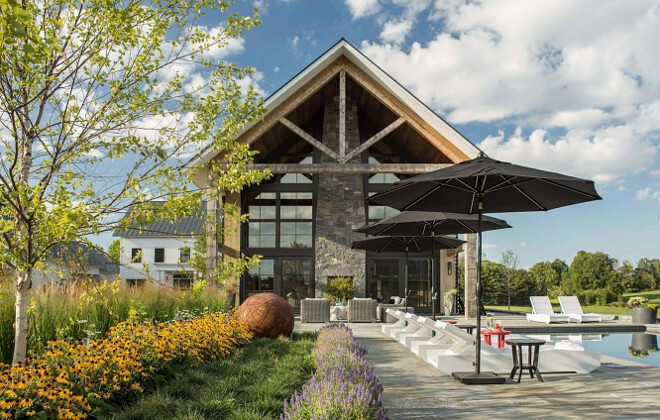 Interior Design: Nancy Galasso and Richard Cerrone from Lillian August Design Center in Norwalk CT.
Oh, yes… this one drops our jaw, doesn’t it? 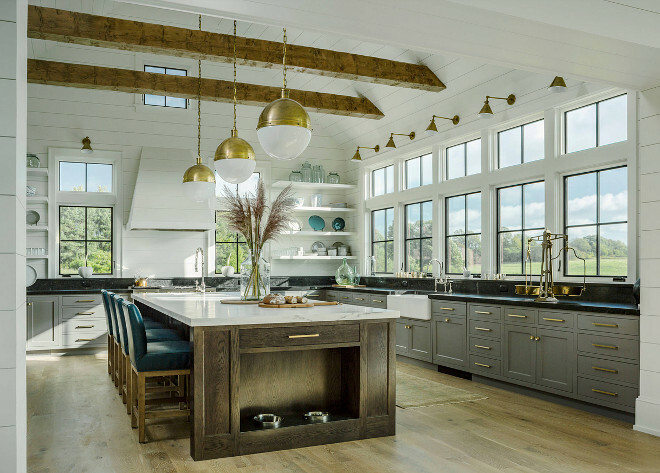 This farmhouse kitchen features vaulted ceiling, exposed beams, shiplap walls, shiplap ceiling, black metal windows, grey lower cabinets, open shelves, large oak island, brass cabinet hardware and brass lighting. The brass lighting is TOB5064HAB-WG Hicks Extra Large Hicks Pendant in Hand-Rubbed Antique Brass with White Glass from Circa Lighting. 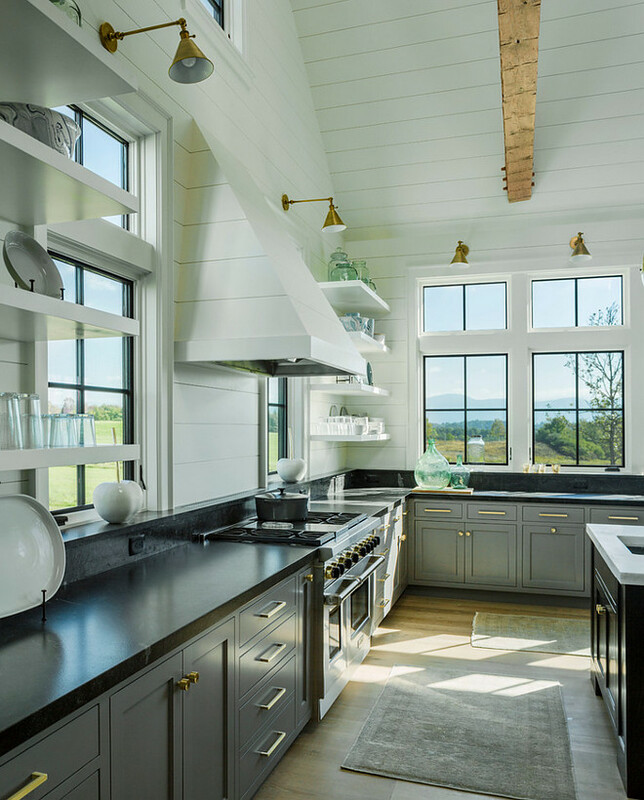 Two-toned kitchen with grey lower cabinets and white shiplap hood and white open shelves. Linen counterstools are from Restoration Hardware. Interior design by Chango & Co. 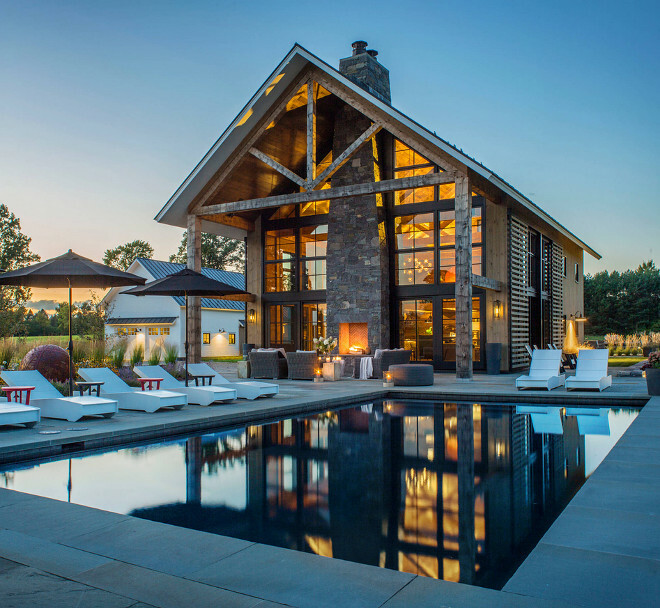 Architecture by Thomas H Heine Architect PC. 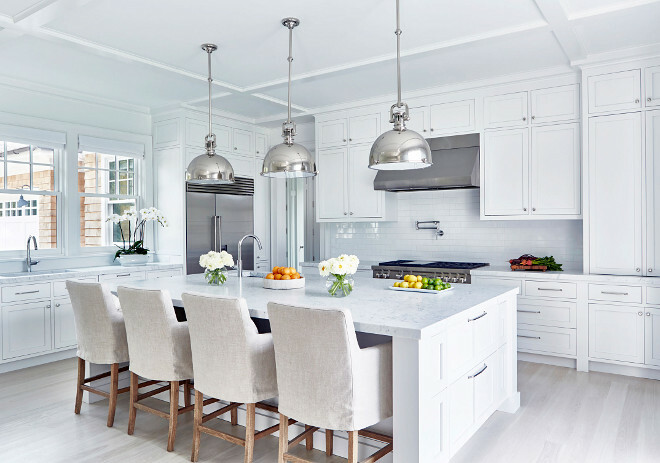 Kitchen pendants are from Circa Lighting. Kitchen island with shaker style cabinets and oversized pulls. 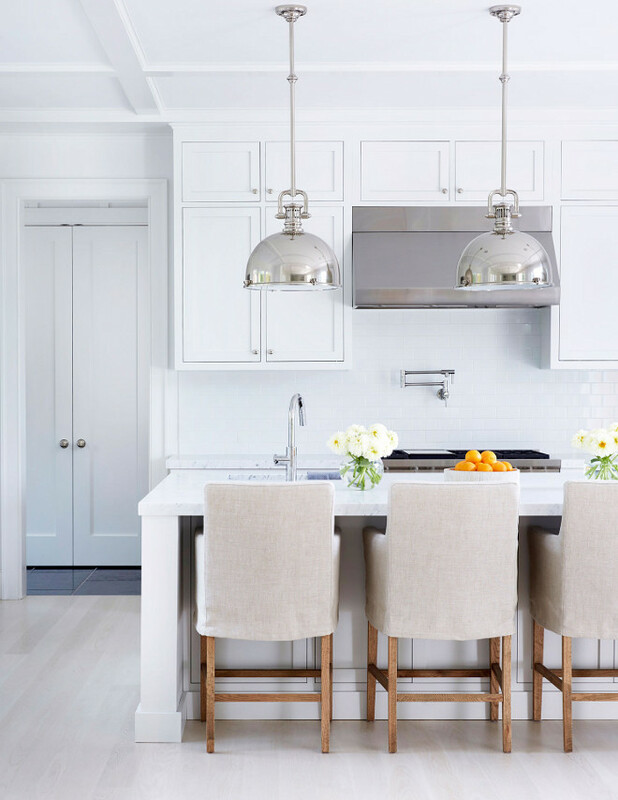 Countertop is 2″ thick Carrara marble. Dining room with four pendant lighting and three flower arrangements. 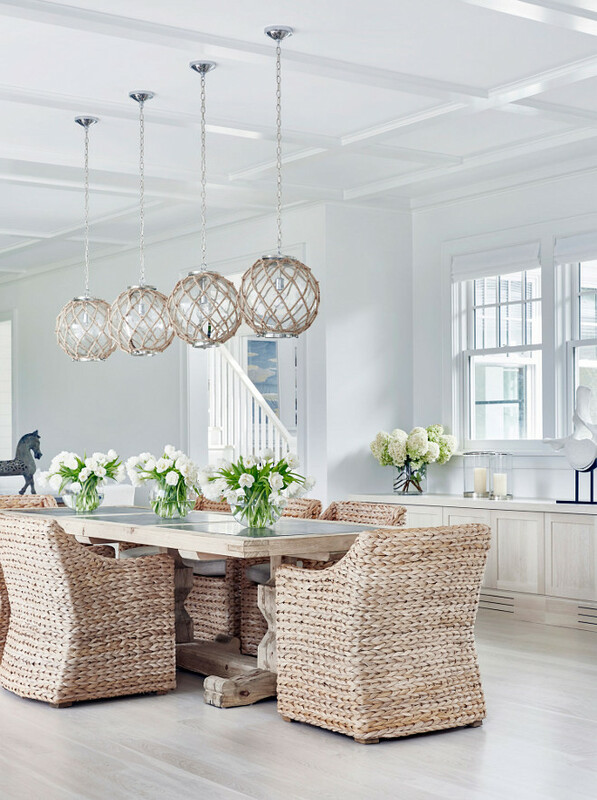 This dining room feature braided woven abaca dining chairs. Decorator’s White, CC-20, Benjamin Moore in eggshell. 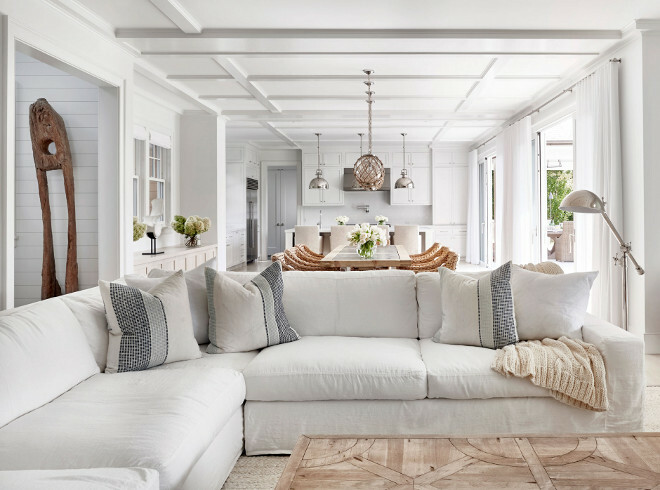 Living room with coffered ceiling, white linen sectional and sisal rug. 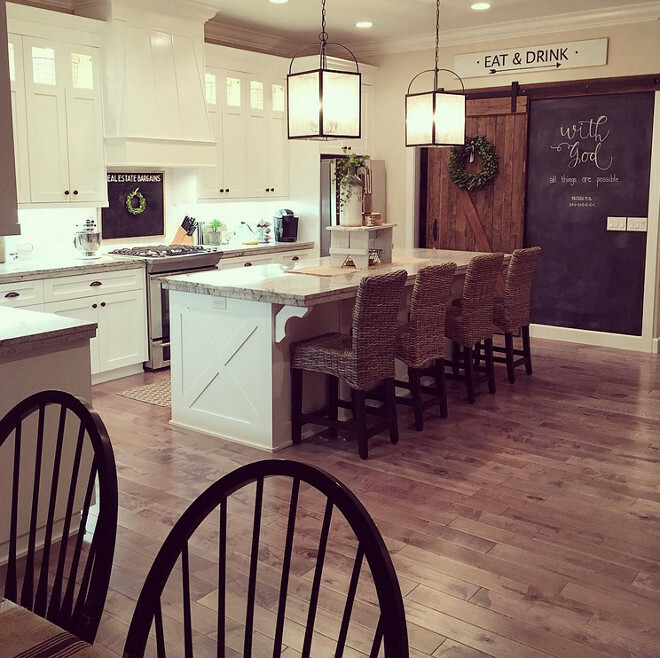 Farmhouse kitchen with reclaimed wood barn door to pantry and chalk painted wall. 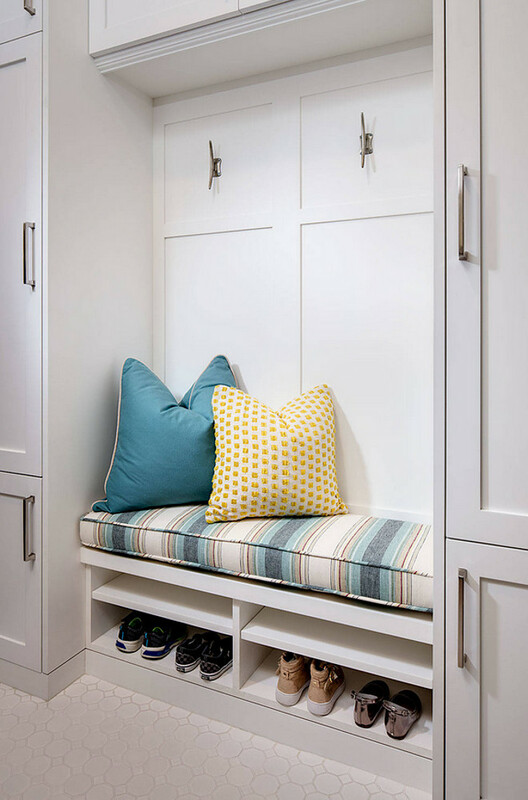 The cabinet color is “Sherwin Williams Extra White”, wall color is “Valspar Coconut Milk”. The lighting is from Kellys Lighting. 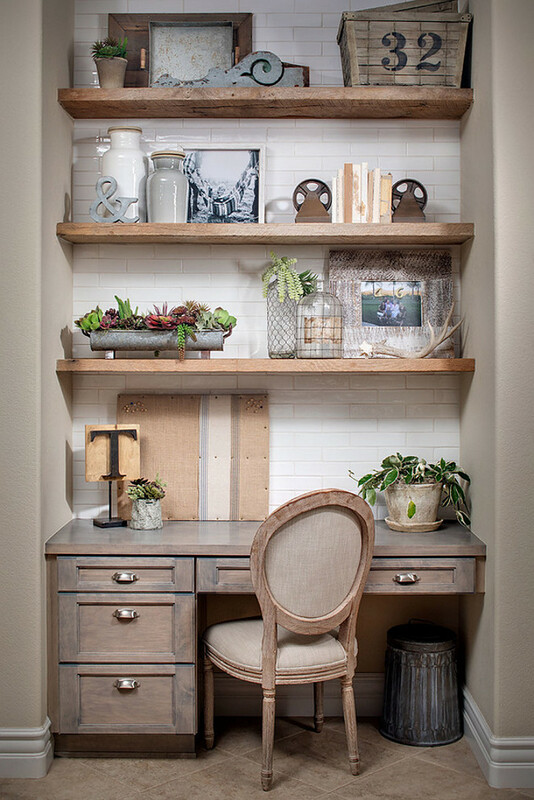 Farmhouse kitchen desk area with greywashed cabinets, greywashed reclaimed shelves and subway tile backsplash. 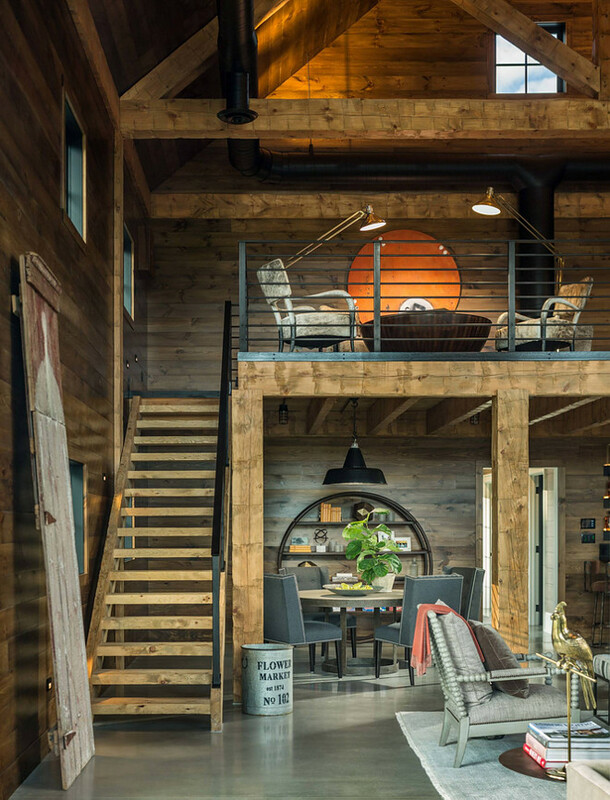 Rustic barn with barnwood shiplap, black pane glass sliding doors and concrete floors. 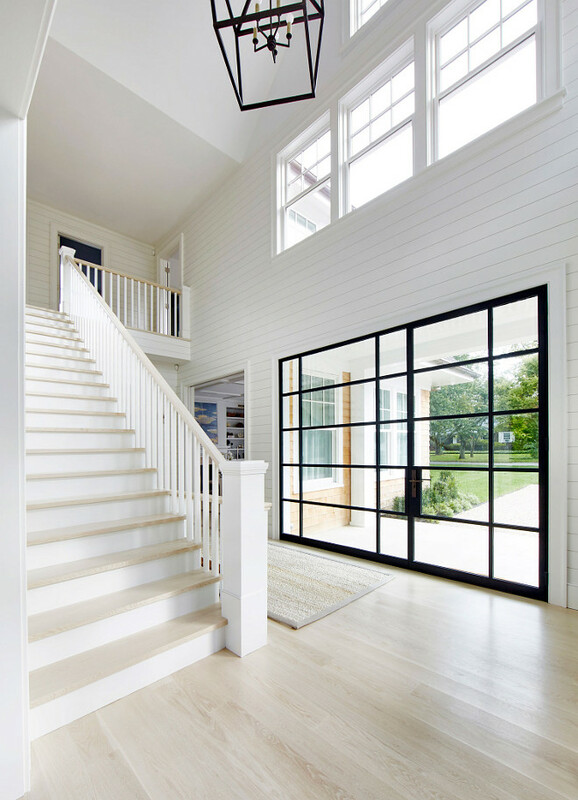 Black Pane Front Door Dimensions: The door is 48″ wide and 96″ high. The sidelights are 24″ wide. Lighting are CHC2165AI Darlana Medium Lantern in Aged Iron. Open foyer with traditional paneling and copper cluster pendant light. Foyer with V-groove wall paneling, black metal doors, sisal runner and vintage reclaimed wood benches. 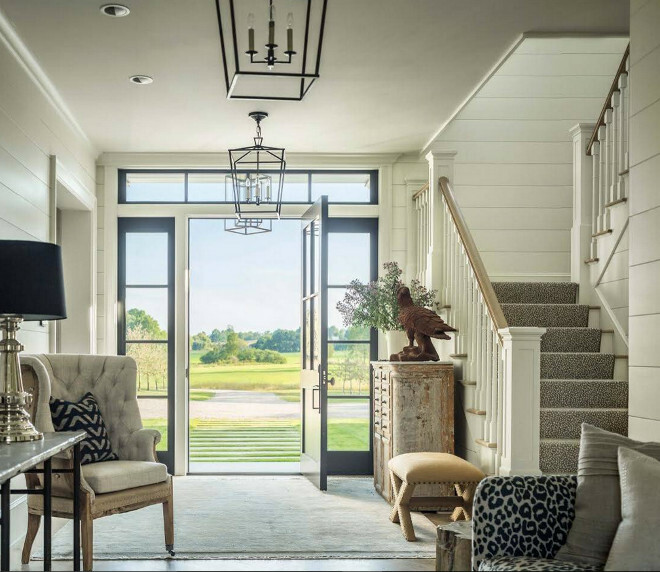 Hamptons style home with tongue and groove wall paneling, black metal doors and oil bronze Currey & Co Pendant Light. 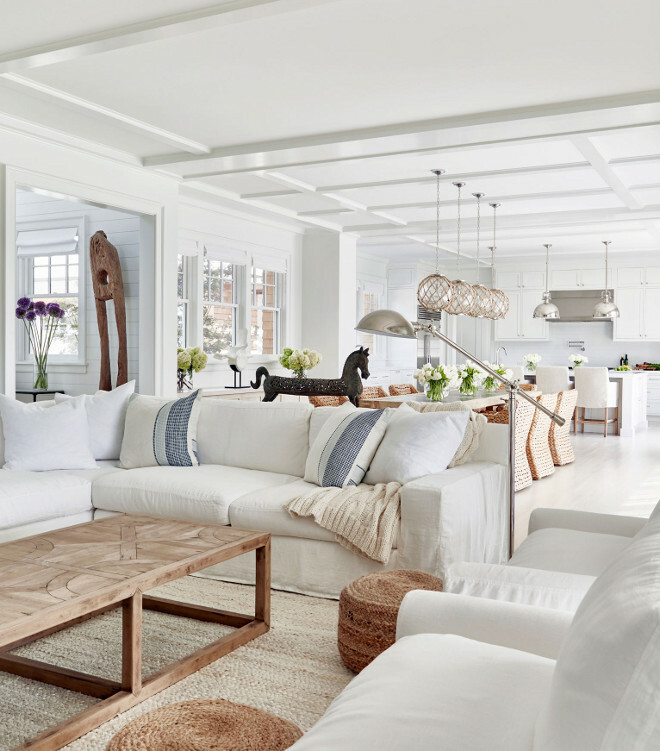 Hamptons style living room with bleached wood floors, white walls, white slipcovered sofa and reclaimed wood and zinc top console table. 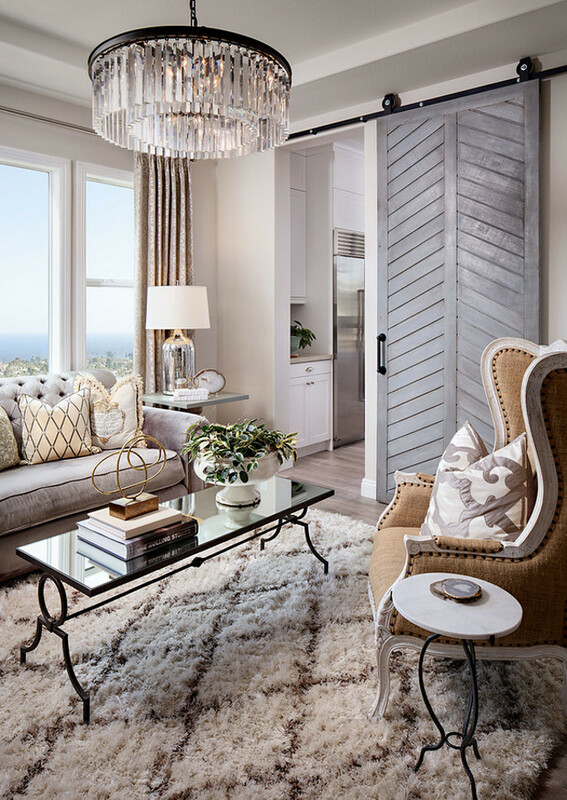 Living room with chevron wood barn door. 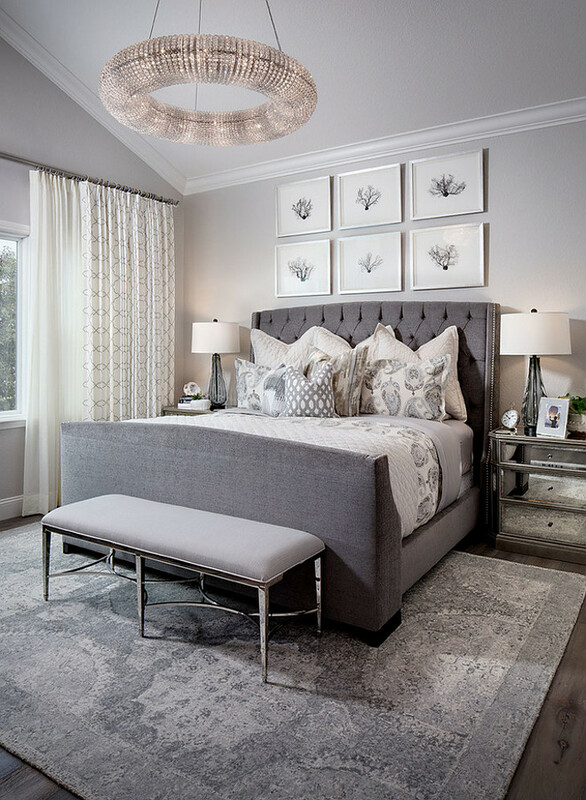 “Sherwin Williams Agreeable Gray” – SW7029 Agreeable Gray by Sherwin Williams can work with almost any color palette, any decor. I love it! 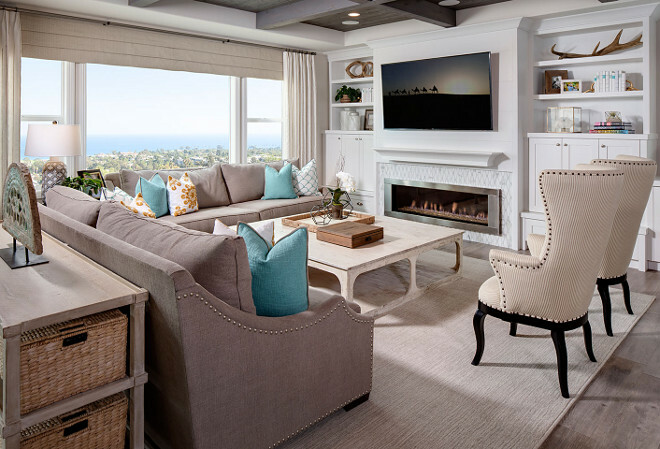 This family room does not compromise on style. It’s comfortable, inviting yet tailored. 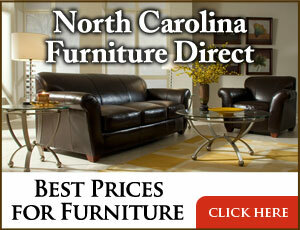 Chairs are Noir Furniture and pillows are from Pottery Barn. 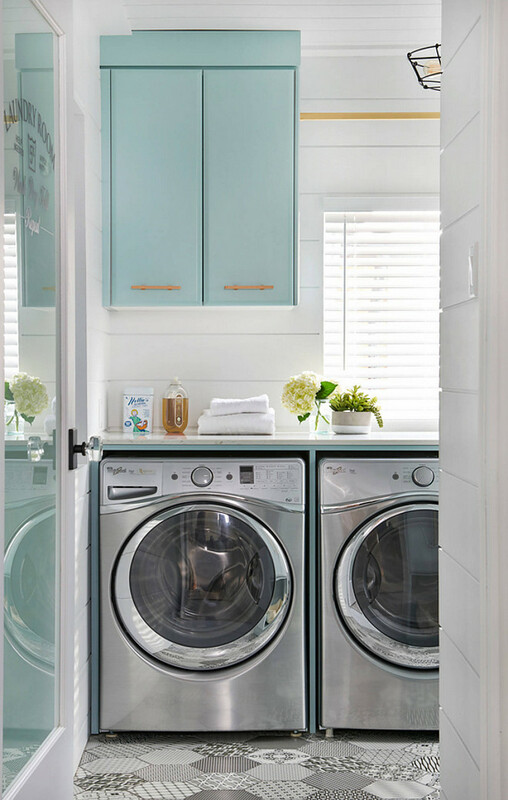 Light Turquoise Cabinet Paint Color: “Gossamer Blue 2123-40 by Benjamin Moore“. 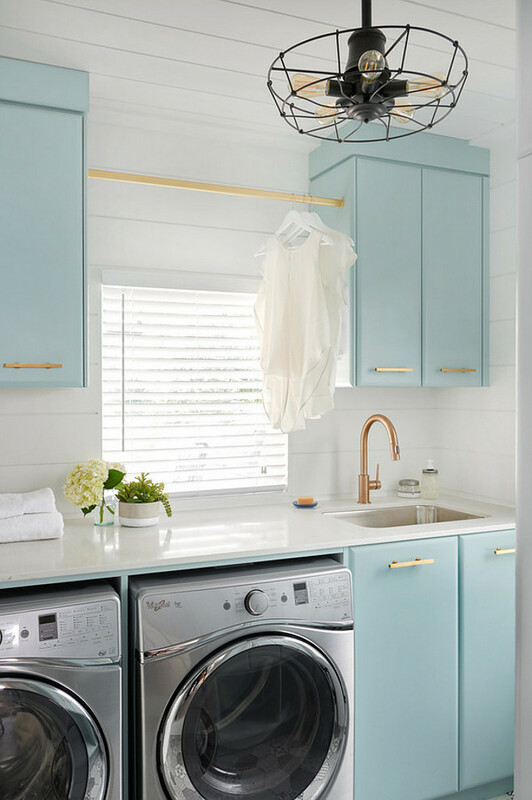 Laundry room with matte brass hardware and Tiffany’s blue cabinet. 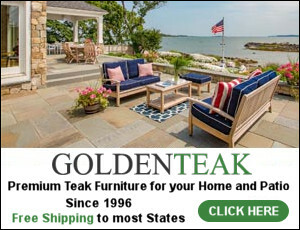 “Sherwin Williams Agreeable Gray” is one of the most popular grey paint colors by Sherwin Williams. 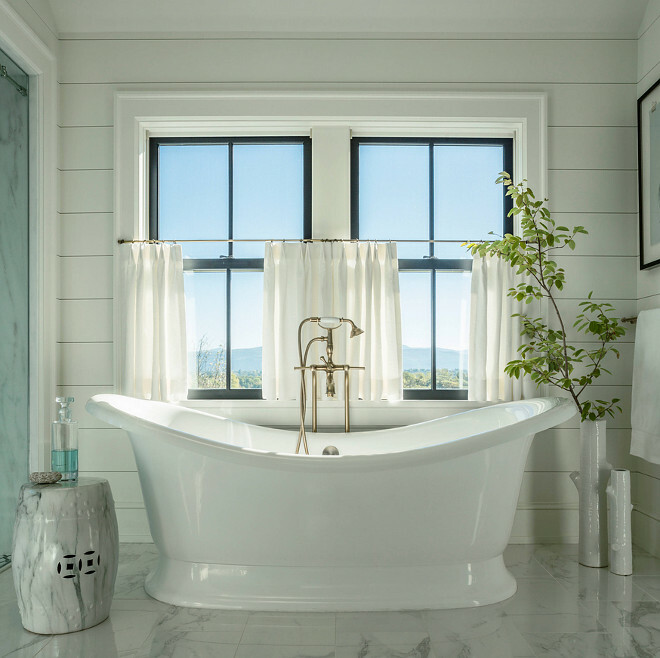 Farmhouse bathroom with black pane windows, cafe curtains and free standing bath. 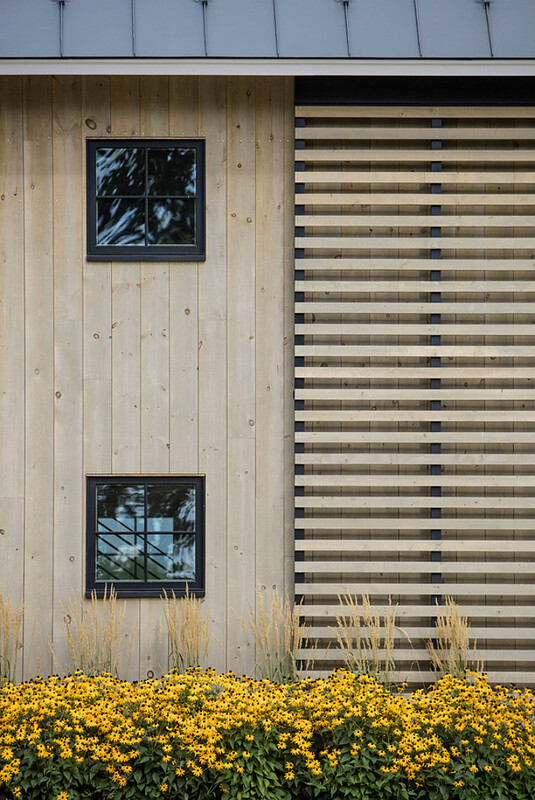 Wall paneling is tongue and groove. 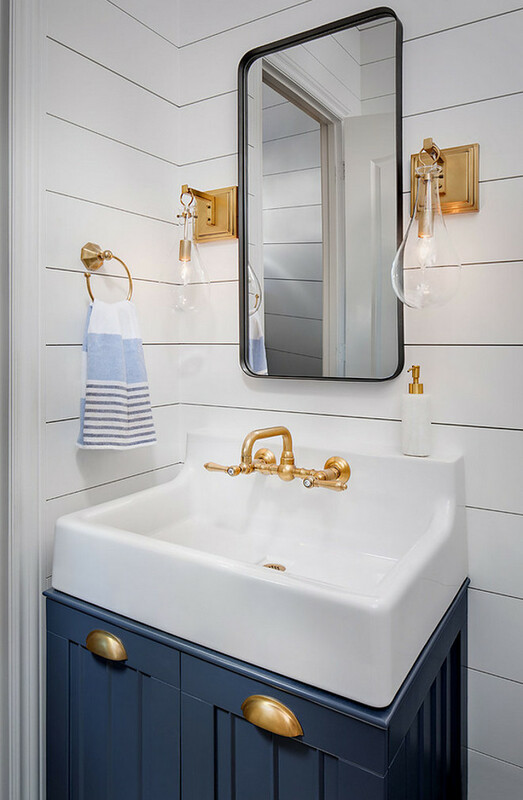 Powder room features small navy vanity with brass hardware, wall mounted faucet, brass sconces and white shiplap wall paneling. 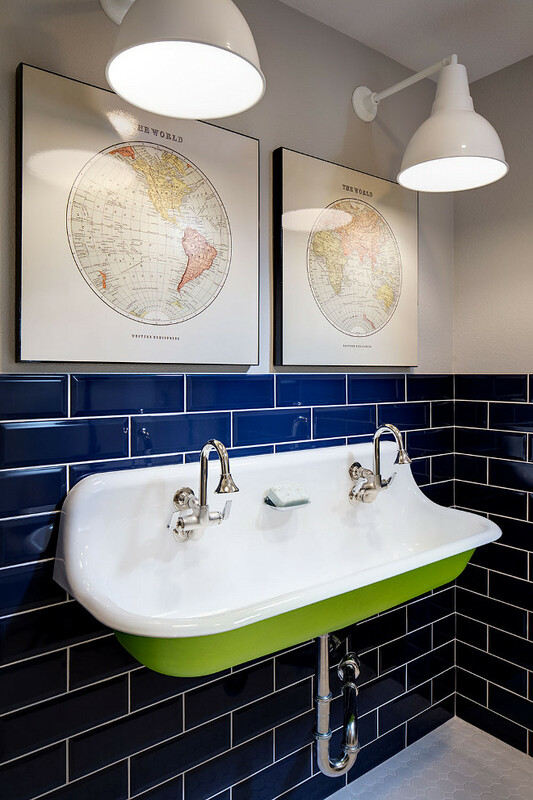 Boys bathroom with Indigo subway tile and Kohler Brockway Sink. 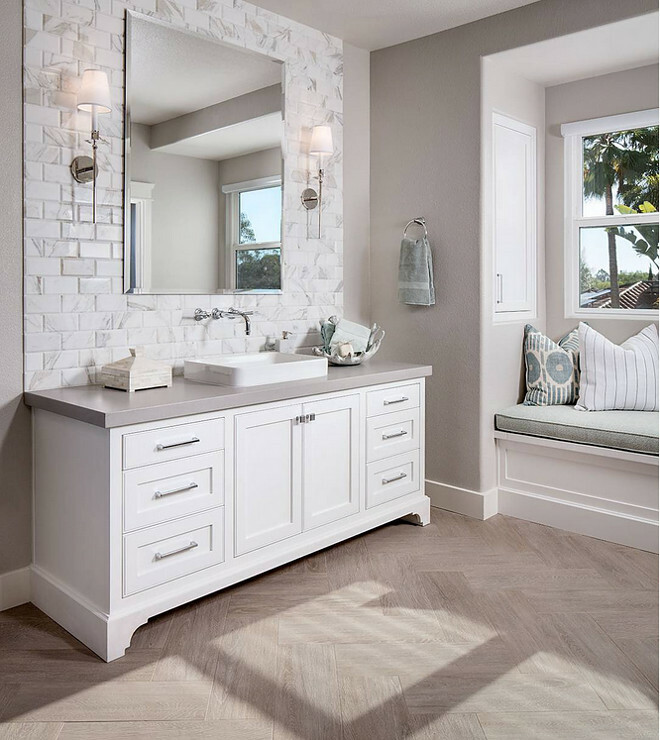 Creamy white paint color – the paint color is Valspar Coconut Milk. Great Grey Paint Color: “Miner’s Dust DEC786 Dunn Edwards”. 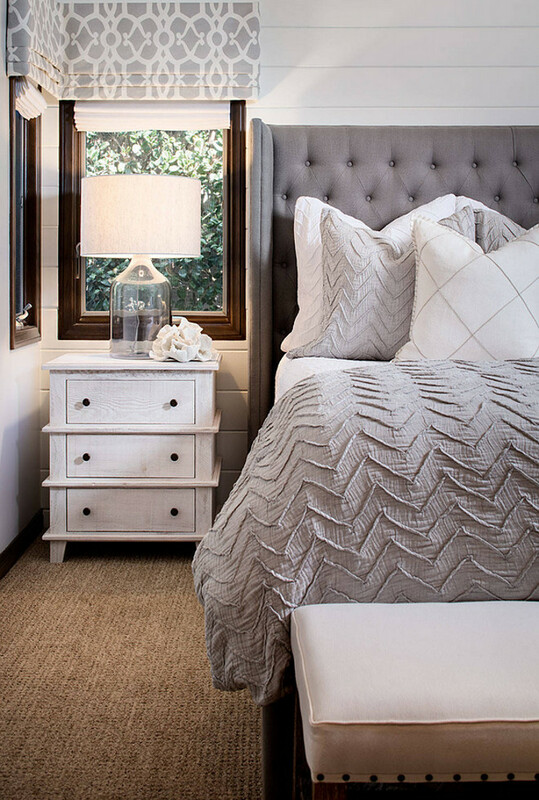 Neutral bedroom with white shiplap walls, grey and white bedding and whitewashed wood nightstand. Bedding is from Anthropologie, part of the Textured Chevron bedding collection. 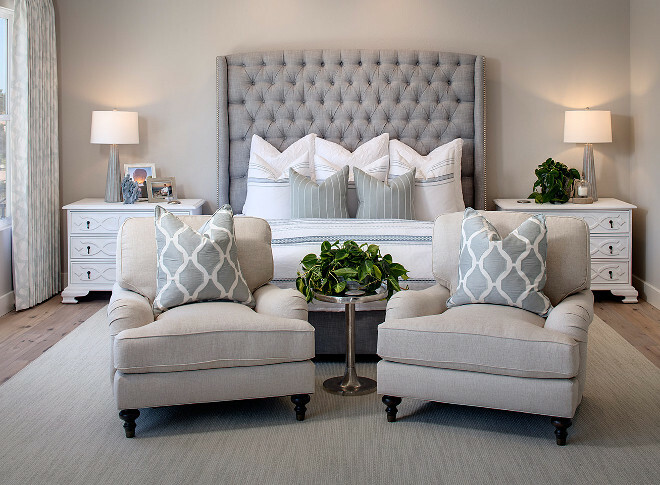 The nightstands are from Noir Furniture and the bed is custom made. Greige, Grey & White Bedroom Paint Color: Sherwin Williams SW7029 Agreeable Gray. 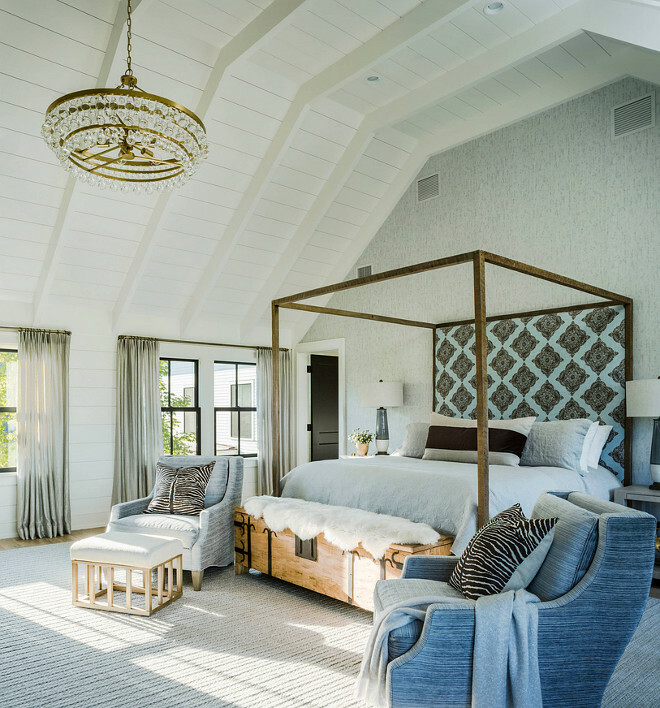 Farmhouse master bedroom with Bling Chandelier by Circa Lighting, vaulted ceiling with tongue and groove paneling. 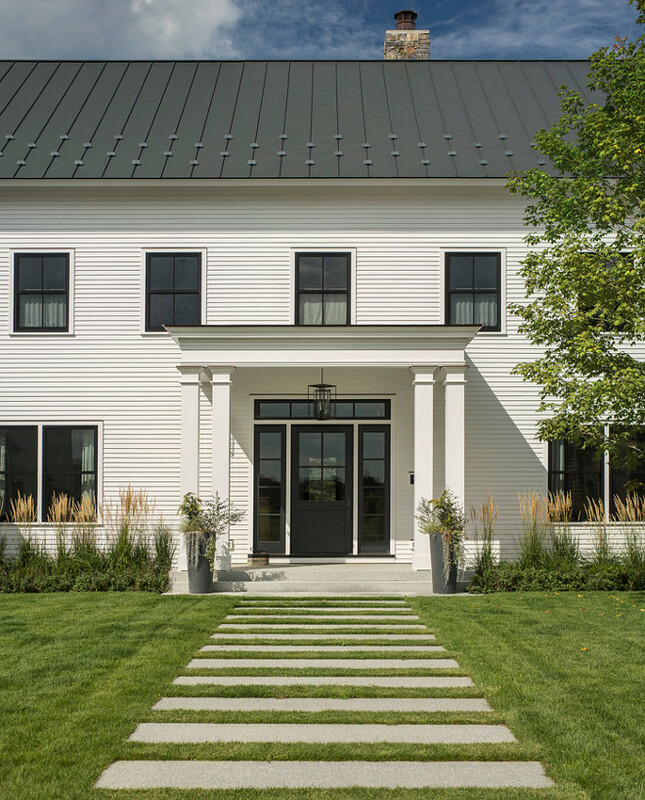 Modern farmhouse extension with metal roof, black pane windows and paved porch. 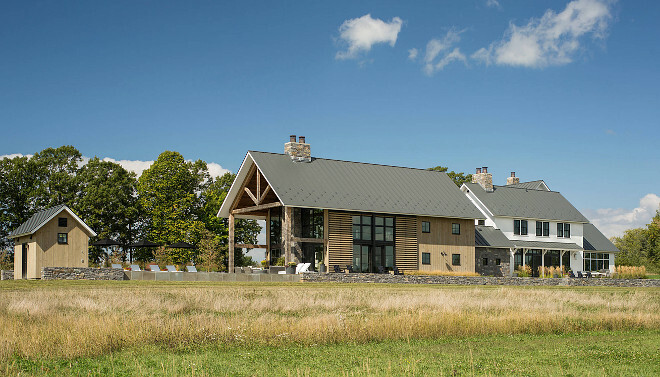 Farmhouse with timber, metal roof and stone chimney. 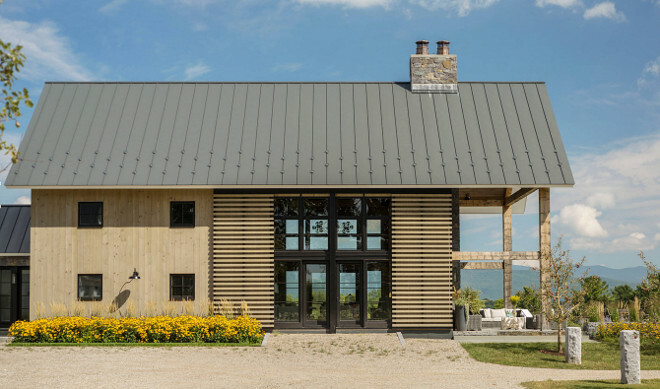 Farmhouse exterior with tongue and groove paneling and wood slats. 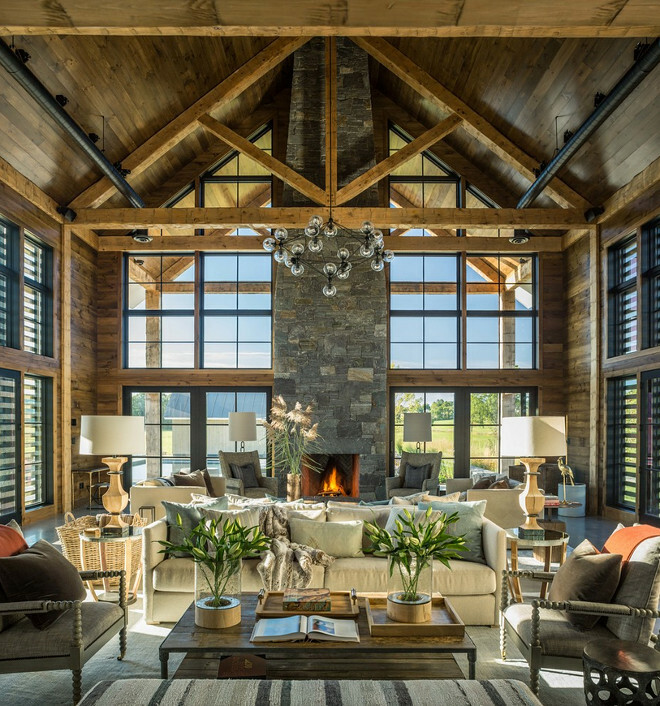 The farmhouse feature wood slat barn doors. 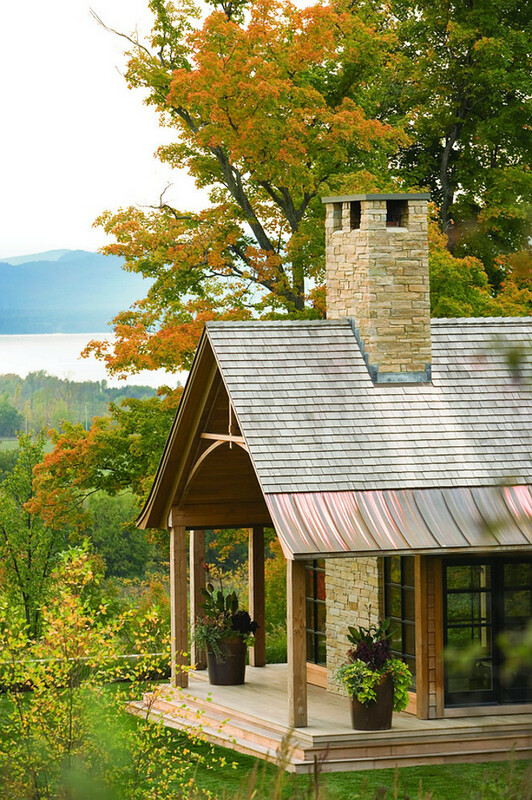 Cabin with shake roof with copper and stone chimney. 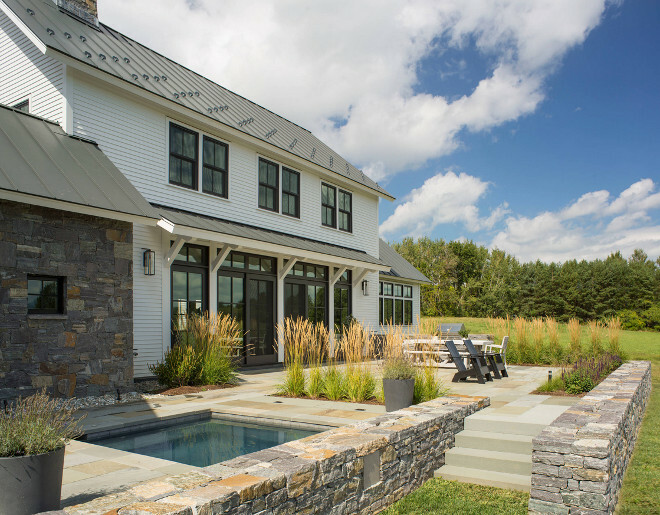 Stone is Adirondack Buff. The roofing is natural wood red cedar shingles. 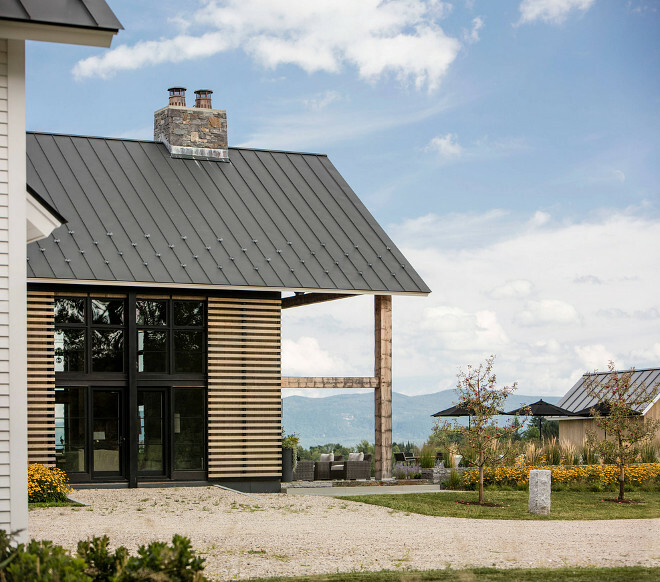 The roof edge is copper standing seam. 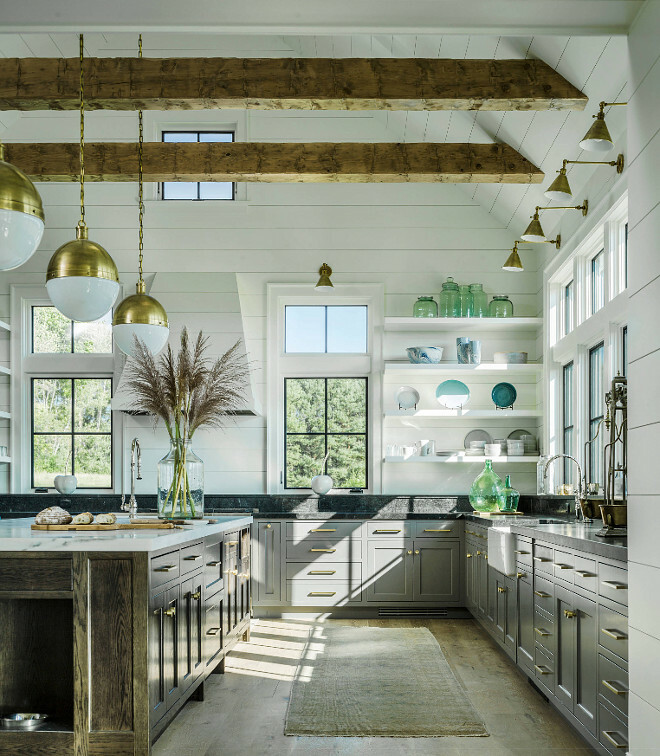 Wednesday: Coastal White Kitchen with Turquoise Island. Did you have a good week? Mine was very, very busy. As many of you know, we have three kids and they love sports. There’s nothing wrong with that, the problem is when all of them want to do an activity at the same time. We support and encourage their healthy habits, but it can get really busy when you need to drive one kid to one activity and the other, to the next… I am the kind of person that likes balance. I know that things can get exhausting without a good amount of balance in our lives, but it’s so hard to keep things balanced when you have a big family. You want to support all of them but when you do that, things get busy quite fast! As much as I wish I could, I am not being able to keep things balanced at this moment. Dinners are not getting done at the normal time and the laundry keeps growing. What is helping me is knowing that these activities aren’t too long and they should be done in two months. Two months! Yikes, right? There’s one more thing I wanted to say to you. 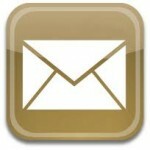 As things go on in our lives, I feel that the best we can do is to cultivate Love. Even when things get really crazy and everyone is tired and grumpy, try to cultivate love. Cultivate love by listening to the people around, by keeping calm when things are not going the way you think they should and cultivate love by being kind. Kindness is the fuel for love. I truly hope you have a great weekend and that you feel happy, healthy & fulfilled. You have everything you need right there, inside of your heart. 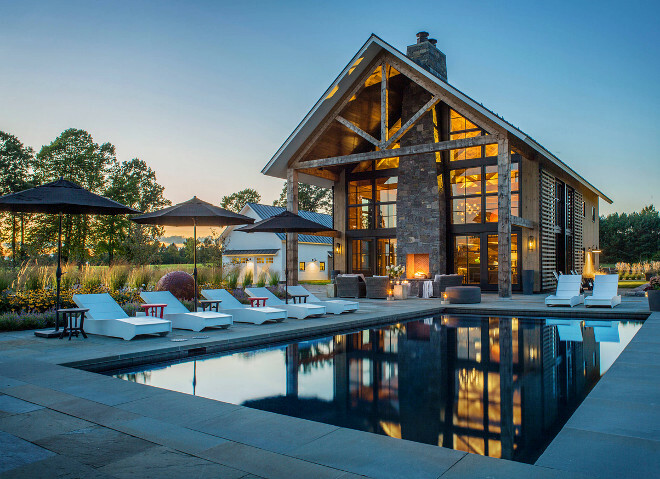 Sources: 1st image: Roundtree Construction – TruexCullins Architecture. 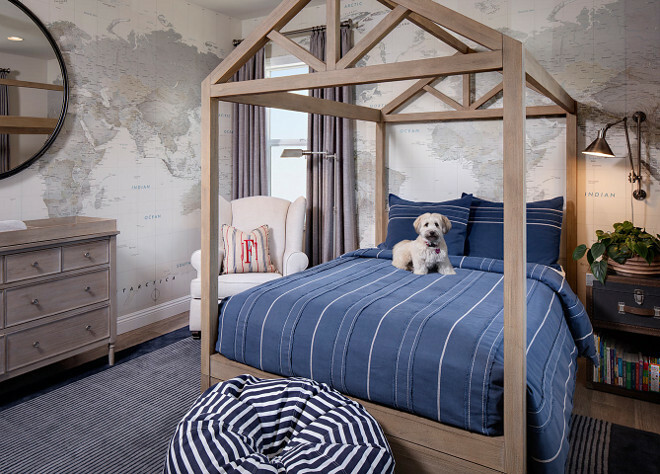 Interior Design: Nancy Galasso and Richard Cerrone from Lillian August Design Center in Norwalk CT. Remaining Images: Specified below each image. 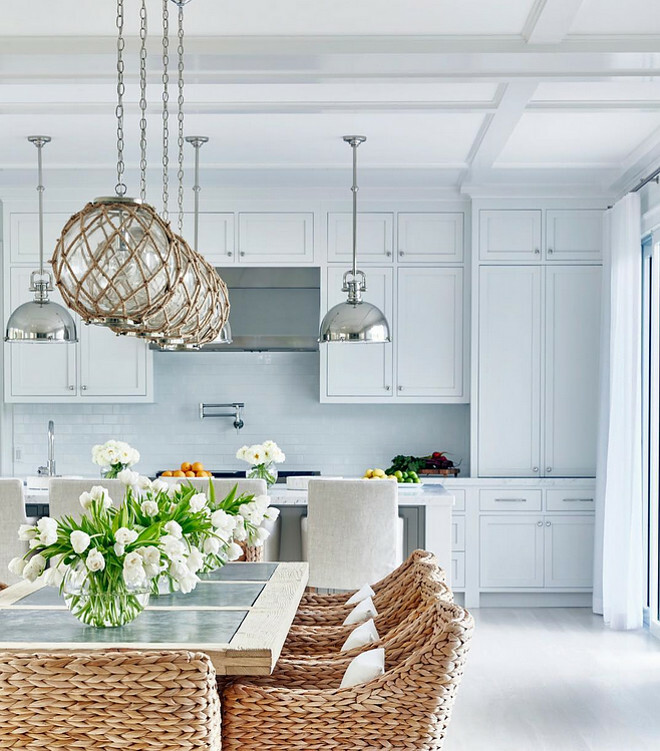 Where are those 4 pendant lights above dining table in the house with BM’s decorators white wall color?! The round glass ones with rope. Thank you!